"Ideals are like stars; you will not succeed in touching them with your hands. But like seafaring man on the desert of waters, you choose them as your guides and following them you will reach your destination." So said Carl Schurz. Your entrepre­neurial and organizational Vision, Mission and Values (VMV) are your ideals, your business concept. Whether you think about them consciously and vigorously or not at all, they are there in every aspect of your business. They are in your choices of products and services, location, business partners, customers and others. They are in the way you plan, organize, lead and control. They are in all your policies, systems, rules and procedures. They are expressed through the language and tone of communication in your business. They are visible in every piece of furniture, fixture and they way you arrange them. Your management team uses them to get things done and going. They form the basis for every decision and action that you take. When your VMV are unclear or unarticulated, everything in your business is topsy-turvy and anything goes. Gary Hamel in his book, Leading the Revolution, has this to say: "A business concept generates profits when all its elements are mutually reinforcing. A business concept has to be internally consistent - all its parts must work together for the same end goal. Almost by definition, a company with mediocre performance is a company where elements of its business model work at cross purposes." * Innovation; "Thou shalt not kill a new product idea". * Tolerance for honest mistakes. * Product quality and reliability. * "Our real business is solving problems"
* Spend a lot of time making customers happy. * Go the last mile to do things right; seek superiority in all we undertake. * Technical contribution to fields in which we participate ("We exist as a corporation to make a contribution."). * Respect the opportunity for HP people, including the opportunity to share in the success of the enterprise. * Contribution and res­ponsibility to the communities in which we operate. * Affordable quality for HP customers. * Profit and growth as a means to make all of the other values and objectives possible. * Continuous progress via creativity, dreams, and imagination. * Fanatical control and preservation of Disney's "magic" image. * "To bring happiness to millions" and to celebrate, nur­ture, and promulgate "whole­some American values". * Improving the quality of life through technology and innovation. * Individual responsibility and opportunity. * To experience he sheer joy that comes from the advance­ment, application, and innovation of technology that benefits the general public. * Respecting and encouraging each individual's ability and creativity. These companies have been successful for more than 50 years now and are still growing and reaping more successes orga­nizationally and financially. Peters and Waterman found out in the course of their research for and writing of their book, In Search of Excellence, that companies whose articulated goals are financial did not perform nearly as well in terms of dollars and cents as companies with broader sets of values. At the core of an organization's exceptional performance are its VMV. In this our Journey on Entrepreneurship, we have, in the past four columns, focused on your Vision and Mission. In the next few columns, we shall reflect on Values. Let us call to mind what James Cash Penney once said, "Golden Rule princi­ples are just as necessary for operating a business profitably as are trucks, typewriters, or twine." World Peace. Hermie Adriano of Goodyear says that a good person is like a lighthouse. Like the lighthouse, he/she doesn't ring bells or fire guns to call attention. He/she simply shines. Shine and infect others with your bright disposition. 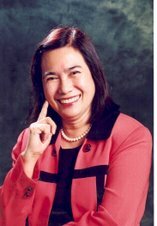 Ms. Moje Ramos-Aquino is president of Paradigms & Paradoxes Corp, a facilitator of strategic thinking process. She awaits your feedback at moje@mydestiny.net.